Once we had metaphorically signed on the dotted cyber line, I almost immediately became terrified. Not that I in any way doubted Ryan’s abilities. Ryan’s reviews are meticulous, well written, honest, and often humorous critiques of some the most iconic films the industry has to offer. No, the pangs of uncertainty that settled in the pit of my stomach were all derived from one question. How could I possibly do justice to a film that I hold in such high regard? Everyone, for their own personal reasons, has an opinion of what they consider to be their favorite film; and not much, short of a new found favorite taking its place, is going to change that opinion. I could read twenty negative reviews of Rear Window (although I’m almost certain I’d be hard pressed to find that many), and they would do nothing to change my top seeded ranking of a film that has held fast to the position for over 25 years. It takes more than the simple qualification of just ‘being good’ to solidify a film as a personal favorite. Perhaps an aspect of the narrative speaks to a viewer, or they recognize themselves in a character. Or maybe it has more to do with the time in their life when they first saw the film, or the people they shared the experience with. Or possibly the film imbued them with a sense of something new, something the individual had yet to gain from any prior cinematic experience. Whatever the reason, once the credits roll, the viewer is somehow…different. With the reputation that precedes a film like Rear Window, coupled with my admitted adoration, it would seem that simply trying to convey the how’s and why’s that make this a great film, would be a bit unnecessary. Instead I believe my words would be better spent explaining why this movie, over every other film I’ve ever seen (and in a life that spans forty-three years, that’s a lot of movies), this film comes out on top. What is it that made Rear Window my favorite film? In the summer of 1985 I was fifteen and already considered myself a film aficionado. Of course, like most fifteen year olds, I was full of crap. The grandest of my cinematic world consisted of Star Wars, E.T., and Raiders of the Lost Ark; all phenomenal films, but they made for a narrow representation of what truly great filmmaking could be. One afternoon my mother rented Rear Window on Betamax (yes, we were “those” people), explaining that this was a film she had enjoyed from her childhood and thought I would as well. She invited a friend of hers from the neighborhood to join us and together we sat down (me on the floor with my fifteen-year-old’s cynicism) to share a lazy summer afternoon of moving pictures and popcorn. From the moment the now all too familiar, chish-chi-chi-chish riff of jazzy cymbals heralded the opening score, I knew I was in for something different. The film itself just looked different. The colors had been somewhat muted by years of negative deterioration, but somehow they still maintained a certain vibrancy that can only be captured by the charm and character of the 1950’s. Jimmy Stewart’s L.B. ‘Jeff’ Jefferies, seemed worldly and adventurous as the well-traveled magazine photographer (photography was a hobby of mine at the time and would later become my minor in my all-too-brief college career). And Thelma Ritter was absolutely delightful as the quick-witted home nurse, Stella. And then there was Grace. 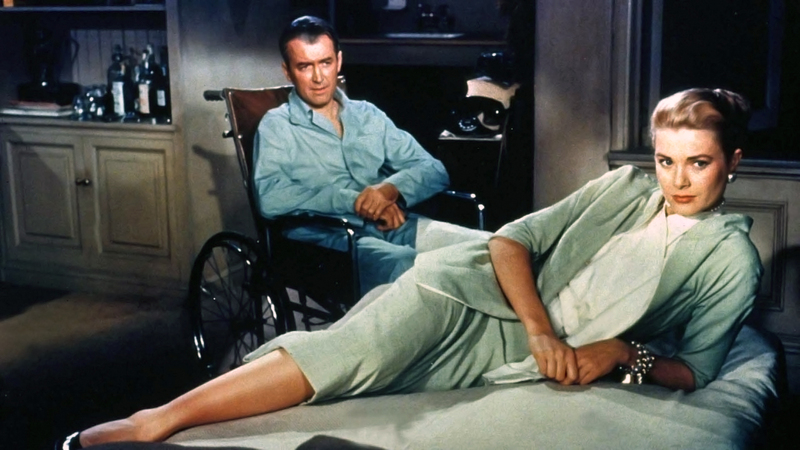 Grace Kelly’s entrance in Rear Window is one of the most stunning to ever be captured on film. From her first striking close-up, to the slow motion kiss she delicately gives to a sleeping Jeff, all capped off by her literal introduction as she turns on the apartment lights, “Lisa…’click’…Carol…’click’…Fremont…’click’”. Breathtaking. The costuming for Rear Window was created by the incomparable Edith Head. 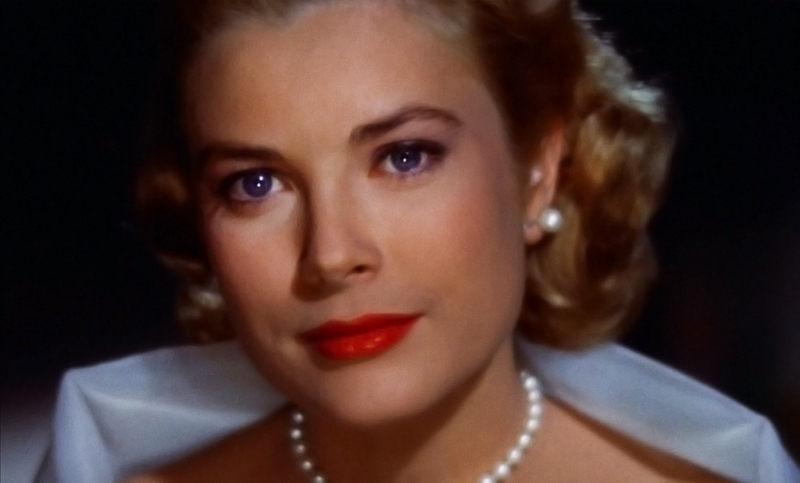 Grace Kelly’s style in this film is classic, timeless, and exquisite. I am by no means an expert in fashion, but this is unequivocally how a woman should dress. From that moment on I was smitten; the characters, the fashion, the beauty, the dialogue, the humor, the story. And oh, what a story, full of twists and turns and an almost unbearable suspense; the moment when Lisa is trapped in Thorwald’s apartment as we see him walking up the hall as Jeff watches helplessly from across the courtyard, had me transfixed, hand over mouth, to the screen. After the film’s climax (which included a three story fall that, to this day I am still unsure how Hitchcock pulled off in 1954), I immediately wanted more. I knew I had seen brilliance in simplicity. This was not a special effect ridden stunner, or an action packed blockbuster, this was a slow burner that plunked you down in that tiny apartment and captivated your attention until the very end. At the age of fifteen, like a lot of teenagers, I did not have a good relationship with my mother (although I’m happy to say that as an adult our relationship is thriving, and she is the most treasured person in my life). At that time, for her to share something with me that she had loved from her youth, offered a brief moment where we could find common ground; a minor truce in a teenage war that left an indelible mark and fueled a passion for the next 28 years. This film completely changed my ideals about what a great film could be. It is the catalyst that sparked my life-long infatuation with film. My mother has always known that Rear Window is my favorite film, but I’m sure she has no idea she is one of the main reasons why. Coincidentally, April 12th (the day of this posting) is my mother’s birthday. So, Happy Birthday, Mom. And…thank you. I’ll leave you with a final thought about Hitchcock himself. One of the brilliances of Hitchcock was his ability to imbue each of his films with his own personality. Just like there’s no mistaking the whimsy of a Wes Anderson film, you can always spot the sly humor and nail-biting tension of a Hitchcock film. The story that follows is a perfect example of the man that was “The Master of Suspense”. In 1963, director Peter Bogdanovich (The Last Picture Show, Paper Moon) had the honorable distinction of interviewing Alfred Hitchcock in preparation for a retrospective of Hitchcock’s work at the Museum of Modern Art in New York. Although the interview itself was fascinating, it’s what happened afterwards that is truly Hitchcock. 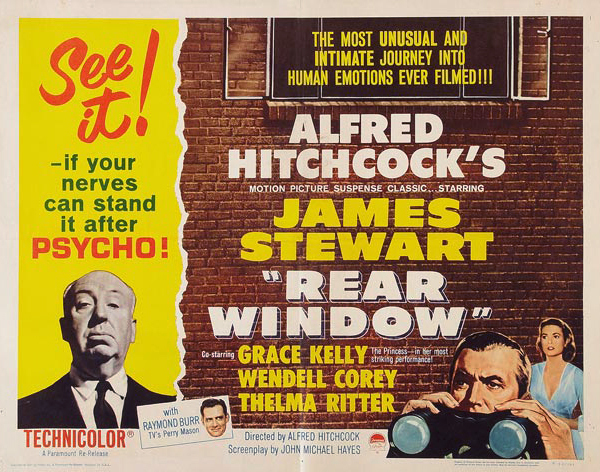 Be sure to head over to Films and Figures and see what Ryan has to say about his first viewing of this Hitchcock classic in his post, Rear Window – Feels Like the First Time. This entry was posted in Essays, Thriller and tagged classic, Edith Head, film, Grace Kelly, Hitchcock, Jimmy Stewart, movie, Rear Window, Review. Bookmark the permalink. Great review! My love of film started as a child sitting with my grandparents. The old films are the best and Hitchcock was a film genius! The lift story was brilliant! I though the elevator story was fantastic as well. 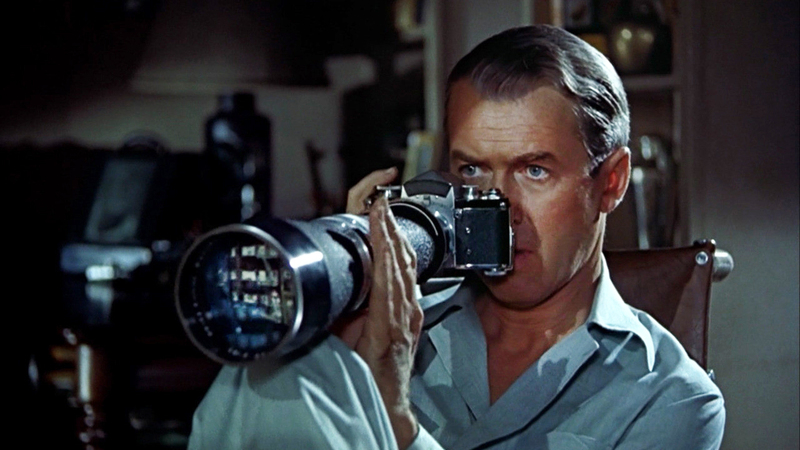 In preparation for this post I watched a short documentary about Rear Window. I didn’t really learn anything new, until Peter told this story over the closing credits. It’s so great to hear him tell it because he does a fantastic impression of Hitchcock. Great review! It was really fun to compare how you watched it with my viewing. I loved what you said about the moment and people you watch a movie with impacting your feelings on it. Two of my favorite movies, Apollo 13 and Happy Gilmore, are closely associated with the people I initially and regularly watched them with (my dad and my friends, respectively). This was such a unique opportunity to share a favorite with someone else that truly appreciates great films. Thanks, Ryan! One of my favourite films. Top work. How can you not love ‘The Master’? You help set my new record for the most “likes” in one day. My Okie-boy’s got my back! Hey – did you get my reply to your email? I only ask because sometimes I have problems with that gmail address. Got it! You shall have my reply later today. Excellent job. For my money, this is probably the best-directed film of all time. But I don’t have much money. Thanks Brian! The fact that you don’t have a lot of money and you’re willing to bet it all on the quality of my favorite film, makes it even more meaningful. …Wait, you weren’t offering to give me your money? Maybe I’ve misread something here. This review was a pleasure to read. I can certainly imagine how terrifying it would be to write something deserving of an all-time favourite, particularly if you’re a cinephile. Based on this article alone I’m going to watch this film. I’m a bit of a scaredy cat when it comes to horror and/or suspense, but I suspect my overall impressions of Hitchcock’s stylings may be wrong (although I’m still not in a hurry to see Psycho)! I’m so glad you enjoyed the piece and it’s inspired you to check out the film. I can assure you that Rear Window is no where near the terrifying experience that is Psycho, but it is quite the nail biter. Please come back and let me know what you thought of the film! You know for such a dedicated movie lover….I am ashamed that I have never witnessed this film. I know, I know, it is sad stuff! But hey, you just reminded me that I should with a fantastically written review! So maybe I should get on that soon! I’m so glad you liked the write-up! This one was really personal for me. And please do give it a watch; it absolutely falls under the category of cinephile required viewing. Wonderful write up on this film. It is also my favorite film. I loved reading your introduction to this film accompanied by the incredible life experience you got out of it in relations with your mother and cinema in general. I’m going to have to check out Ryan’s review later! Thanks so much, Jon! So glad to hear from someone who shares my love of this film and classifies it as a favorite. Terrific review of Rear Window. My favorite Hitchcock-movie is Vertigo, which I consider one of the greatest films of all time. But I like Rear Window as well. My favorite thing from Rear Window? Grace Kelly’s profile! I remember seeing her in the movie and thinking: “Really, was that what all the fuzz was about?” But, then, when I saw her shot in profile I almost fell out of my chair. Wow. I still think that is the most beautiful profile in the world. My first earth-shattering movie experience was Carrier’s Way, which is still one of my two favorite films of all time. Thanks, Christian! Grace really was quite stunning. Isn’t amazing how certain visuals in film can affect us so profoundly?